Action Figure Insider » Barnes & Noble Announces ‘There’s More Fun to Be Done’ with Special Dr. Seuss Events Celebrating His Never-Before-Seen Book, What Pet Should I Get? 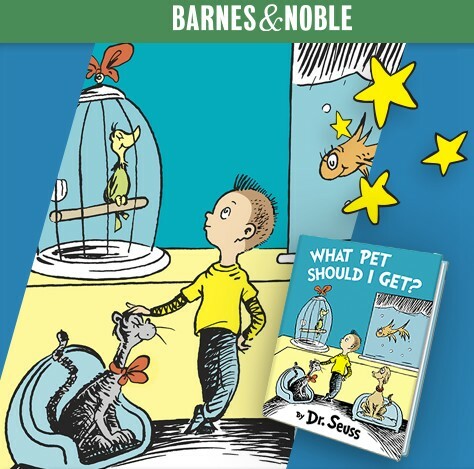 Barnes & Noble Announces ‘There’s More Fun to Be Done’ with Special Dr. Seuss Events Celebrating His Never-Before-Seen Book, What Pet Should I Get? July 27, 2015 08:30 AM Eastern Daylight Time – NEW YORK--(BUSINESS WIRE)–Barnes & Noble, Inc. (NYSE:BKS), the nation’s largest retail bookseller and the leading retailer of content, digital media and educational products, today announced that its month-long Get Pop-Cultured™ campaign will conclude with a fantastic lineup including special Dr. Seuss events celebrating his never-before-seen book, What Pet Should I Get?. Inspired by the July 28 release of What Pet Should I Get?, Barnes & Noble is inviting kids of all ages to its stores nationwide on Tuesday, July 28, at 7pm for a special “What Pet Should We Get?” Storytime event. Participants will use their imaginations to help their local store decide what pet to get by creating unique Dr. Seuss-inspired pets for their local store. Plus, customers who buy What Pet Should I Get? will receive 50% off select Dr. Seuss stories, including The Cat in the Hat, Green Eggs and Ham, One Fish Two Fish Red Fish Blue Fish, Horton Hears a Who and The Lorax. This special offer is valid from Tuesday, July 28, through Friday, July 31, in stores only. Barnes & Noble®, Barnes & Noble Booksellers® and Barnes & Noble.com® are trademarks of Barnes & Noble, Inc. or its affiliates. For more information on Barnes & Noble, follow us on https://twitter.com/BNBuzz, http://instagram.com/barnesandnoble and http://thebarnesandnoble.tumblr.com, and like us on https://www.facebook.com/barnesandnoble.